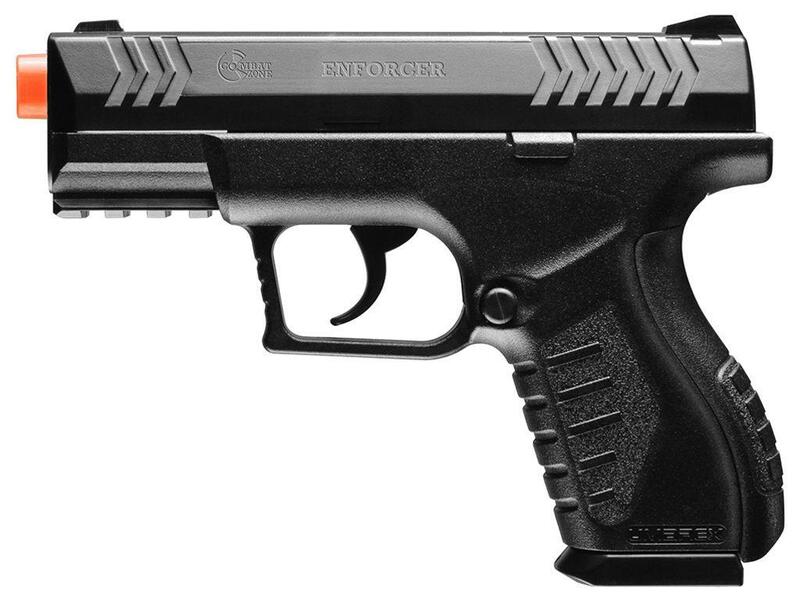 Combat Zone Enforcer Airsoft Pistol | Replicaairguns.ca | New Website! Trigger Pull: The trigger pull on the Umarex Combat Zone Enforcer is medium to heavy, but since it's a double action only trigger, this is to be expected. There is a fair amount of take up with the entire pull being about 8-9 pounds and the release point happening right at the very back of the pull, you get a bit of a clicking sound warning right before it releases. If you are used to shooting other lower-priced double action airguns with protruding barrels, then you will know what to expect with this one. Build Quality: This airsoft pistol has pretty much all the mechanical parts molded into the shell, with the exception of the trigger, safety and magazine release. Most of the build materials are plastic with the exception of some internal parts. This simplistic design does work well and since there are less moving parts there is less that can go wrong. Comments: Compliment your favorite AEG with this semiautomatic Combat Zone airsoft pistol. 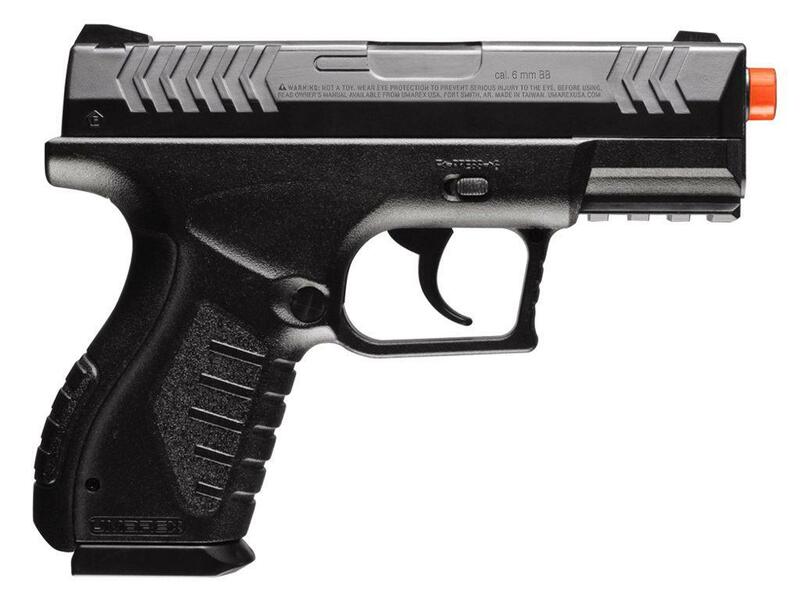 This compact CO2-powered gun is easily concealable and uses standard 12 gram CO2 cartridges as its power source. The gun features a full metal inner barrel for optimal performance, a 15 rd drop-free magazine and a shot velocity of 400 fps (using .12g BBs). The gun also has an integrated accessory rail underneath the barrel for mounting optional flashlights & red dot sights. 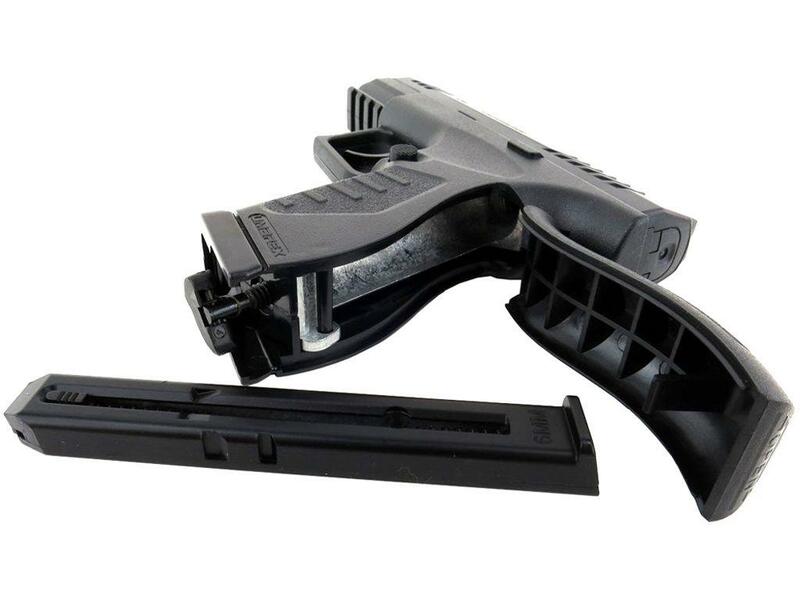 This gun is made for outdoor skirmishes and features a durable ABS plastic frame that protects the internal components from damage. Airsoft enthusiasts do not miss this gun! http://www.ReplicaAirguns.com - Umarex Combat Zone Enforcer CO2 Airsoft Pistol Table Top Review. -15 Round Drop Out Stick Metal Magazine. This video is a walkthrough review of the Umarex Combat Zone Enforcer CO2 Airsoft Pistol. I show off this Airsoft compact pistol close up from all angles and point out the mostly plastic construction and go through the features and benefits of this lower priced yet reliable Airsoft Pistol option. Personally I prefer spending a few more bucks to get air pistols that have more metal and more working parts, but not everyone has 100+ dollars to spend on an Airsoft Gun or do they need it to be super ultra realistic. Some people just want a gun that is easy on the wallet but still offers decent performance and reliability, and to be honest, a simpler design with less moving parts to wear out or malfunction is probably going to give you better reliability at the end of the day. It just depends what you are looking for. Even if you have a few ultra realistic high end airguns, why not pick something like the Umarex Combat Zone Enforcer CO2 Airsoft Pistol to plink around with and save some of the wear and tear on your more expensive Airguns?